How to open Creo file into ISODraw from Windchill? I am trying to figure out how to open a Creo file that is in Windchill straight into ISODraw. I have Work Group Manager installed and communicating with both Windchill and ISODraw, but when I select open in ISODraw and the Windchill button in the WGM no Creo files are displayed. If I navigate in the WGM to a folder on my computer Creo files are displayed and can be opened (imported). I've searched the help and knowledge base, but found nothing. Re: How to open Creo file into ISODraw from Windchill? Simple answer is you can't . When you are running connected to Windchill, IsoDraw and Creo Illustrate will only read in Creo View files (e.g. PVZ) not native Creo Parametric files. I don;t know why this restriction is there, but the idea is that you use the viewable of the Creo model as the source for your illustration, rather than the native file. There's a bit of messing about to do this where you setup the EPMPostPublishDelegate to create the Creo View (PVZ) file as a new document in Windchill and then that is the source. The details of using this are explained in the Windchill help: http://support.ptc.com/cs/help/windchill_hc/wc110_hc/index.jspx?id=WVSPublishRulesPostPublish&action...You'll need your Windchill Admin to do this. "you setup the EPMPostPublishDelegate to create the Creo View (PVZ) file as a new document in Windchill and then that is the source" - does this mean there is another document in PDMLINK that has to be controlled? If you have this set up, would you mind explaining where and how the files are linked? Yes, it creates a new Dynamic Document Publication Graphic that has to managed separately. It can have it's own life cycle state and Revision. By default, it gets created in the same folder as the source CAD document. Here's a screenshot where you can see the original Creo assembly, the viewable, the assembly drawing and the Creo Illustrate file created using the viewable. Windchill does create a relationship between the CAD and the Viewable, but it's not as "strong" as it could be. If you go to the Publication Graphic and create a new tab and how the Published Content under Related Objects, it shows the CAD file that it came from. 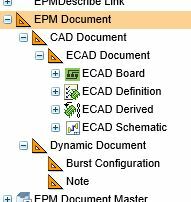 The problem is, that if you go to rename the source CAD file, the Publication Graphic doesn't get selected and I've not seen any way to have it come up via the relationships. the only way I've been able to work out is to relate the Graphic to the WTPart and then you can find it. If I try to create a Graphic in the workspace I get an error stating that I do not have permission. I've had a very quick look at Type and Attribute Management and cannot see a "Dynamic Document Publication Graphic" type listed. Did you have to create the type? I hope you don't mind all the questions? Publication Graphic is the document category (like Assembly or Part for a CAD Document) so you won't see that in the tree.